We are fulfilling desires with aplomb this week. 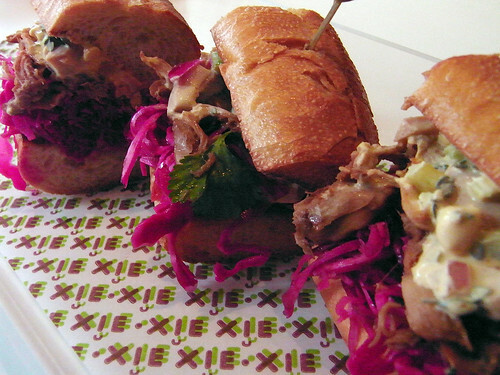 Today we finally meet Zach, the guru of lunch in midtown and we do it over a sampling of Asian sandwiches at Xie Xie. Xie Xie has been on our list since it opened but midtown isn't exactly around the corner. We shared 4 sandwiches, cut 3 ways in order to cover the full range of tastes. Overall everything was pretty solid, a healthy step up from the banh mi of Chinatown but a little heavier handed than Num Pang or An Choi. Definitely worth stopping by if you happen to be near Times Square and more than worth your time if you're looking for tasty and inexpensive dinner options before a show. thanks for sharing ... it's been on my list.... so maybe it's time to pay a visit... did u try the thousand year old egg looking dessert?